Ebbo and Vera Velten have spent the better part of the past twenty years living in different African countries. Ebbo is the manager of a sleeping sickness programme. His work is fulfilling. Vera, however, feels increasingly lost in Yaounde’s ex-pat community. She can’t bear the separation from her 14- year-old daughter, Helen, who is attending boarding school in Germany. Ebbo must give up his life in Africa or he risks losing the woman he loves. But his fear of returning to a land now remote to him increases with each passing day. SLEEPING SICKNESS looks at the life of a European doctor (Pierre Bokma) who runs a programme in Cameroon to counter an epidemic of sleeping sickness, and who ends up being so emotionally split between Africa and Europe that he cannot bring himself to return home to live with his family. This is a complex and sophisticated fi lm that transcends its genre and contains none of the arrogance or condescension that is so often present in European fi lms about Africa. Told in two parts, the film first follows the doctor as he tries to decide whether he should leave his NGO work in Cameroon to live with his wife and daughter in a country he no longer truly calls home. The film then returns to the site of the project several years later from the perspective of Alex (Jean-Christophe Folly), a French son of African parents who is visiting the continent for the fi rst time to evaluate the medical programme the doctor started. Hauntingly enigmatic, SLEEPING SICKNESS won Köhler the prize for best director at this year’s Berlin Film Festival. Ebbo y Vera han vivido en diversos países africanos durante los últimos 20 años. Ebbo dirige un programa dedicado a la enfermedad del sueño que le tiene ocupado todo el tiempo. Vera, sin embargo, se siente cada vez más incómoda en la comunidad de expatriados de Yaoundé. Sufre porque está separada de su hija de 14 años, Helen, que está en un internado en Alemania. Ebbo se ve obligado a renunciar a su vida en África si no quiere perder la mujer a la que ama, pero cada día teme más el regreso a un país que le es ahora desconocido. Negli ultimi vent’anni, Ebbo e Vera hanno vissuto in diversi Paesi africani. Ebbo dirige un programma sulla malattia del sonno e il suo lavoro lo riempie di soddisfazioni. Vera, al contrario, si sente sempre più a disagio nella comunità di profughi di Yaounde. La lontananza dalla figlia di 14 anni Helen, che sta studiando in un collegio in Germania, è diventata insopportabile. Ebbo deve rinunciare alla sua vita in Africa se non vuole perdere la donna che ama, ma rimanda di giorno in giorno il ritorno in un Paese che gli è ormai divenuto straniero. SCHLAFKRANKHEIT ist eine Komplizen Film Produktion und wurde von Janine Jackowski, Maren Ade und Katrin Schlösser in Koproduktion mit öFilm, Why Not Productions, IDTV Film, ZDF – Das kleine Fernsehspiel in Zusammenarbeit mit Arte (Redaktion: Christian Cloos, Anne Even, Birgit Kämper) produziert. 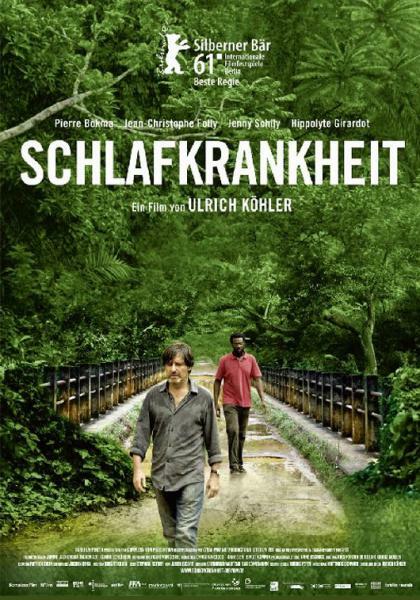 Das Projekt wurde mit Mitteln der FFA, dem Medienboard Berlin-Brandenburg, dem BKM, dem DFFF, der Filmförderung Hamburg Schleswig-Holstein, dem The Netherlands Film Fund, Hessischen Filmförderung, CNC und Media maßgeblich unterstützt und wird von Farbfilm Verleih im Sommer 2011 in die Kinos gebracht.